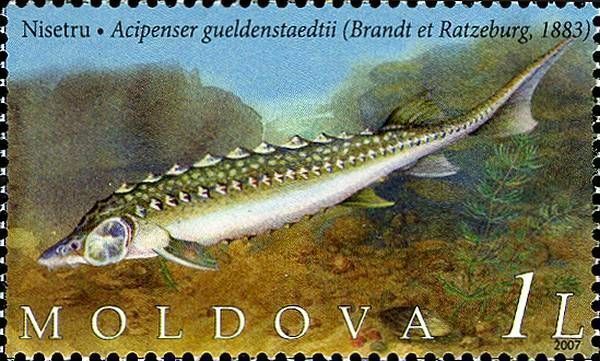 On 6 September 2007, the Post Office of Moldova (Poșta Moldovei) issued a series of postage stamps with the title Protection of Endangered Fish Species in the Dniester River (Joint Issue with Ukraine). The issue comprises two stamps, with associated cancellation (postmark) and first day cover (FDC). The designer was Elena Karacenţev. The printing was performed by Tipografia Centrală, Chişinău. The Dniester River (/ˈniːstər/ NEES-tər; Romanian: Nistru, Ukrainian: Дністе́р translit. Dnister; Russian: Днестр) is a river in Eastern Europe. It runs first through Ukraine and then through Moldova (where it separates the breakaway territory of Transnistria), finally discharging into the Black Sea on Ukrainian territory again. Read more.. This article uses material from the Wikipedia article 'Dniester', which is released under the Creative Commons Attribution-Share-Alike License 3.0. The Russian sturgeon (Acipenser gueldenstaedtii), also known as the diamond sturgeon or Danube sturgeon, is a species of fish in the Acipenseridae family. It is found in Azerbaijan, Bulgaria, Georgia, Iran, Kazakhstan, Romania, Russia, Turkey, Turkmenistan, and Ukraine. It is also found in the Caspian Sea. This fish can grow up to about 235 cm (93 in) and weigh 115 kg (250 lb). Russian sturgeon can not mature and reproduce quickly, making them highly vulnerable to fishing. It is distinguished from other Acipenser species by its short snout with a rounded tip as well as its lower lip which is interrupted at its center. Read more.. This article uses material from the Wikipedia article 'Russian_sturgeon', which is released under the Creative Commons Attribution-Share-Alike License 3.0. 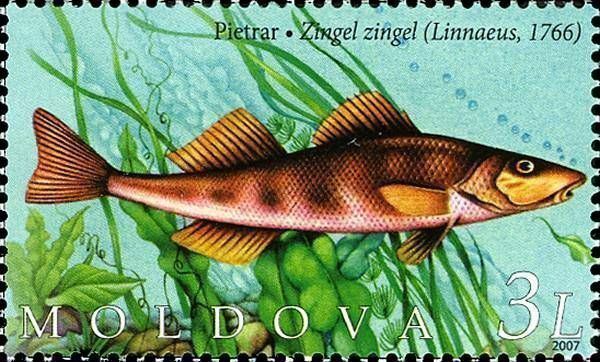 The Common zingel (Zingel zingel) is a species of fish in the Percidae family. It is distributed in the Dniester and Danube basins. Read more.. This article uses material from the Wikipedia article 'Common_zingel', which is released under the Creative Commons Attribution-Share-Alike License 3.0.